If you are looking for a highly-interactive form of entertainment, providing endless photo opportunities, then you’ll love this! Using the very latest camera technology, Magic Mirrors produce high-quality, high-resolution images and have a ton of fun features that can be enjoyed by adults and children alike. Find a Magic Selfie Mirror for hire near you in minutes! Option 1. Enter your event location below & contact a Magic Selfie Mirror directly! Option 2. Request multiple quotes from available Magic Selfie Mirrors Get Quotes! Option 3. Read information & advice on hiring Magic Selfie Mirrors Read Advice! Mirror screen photography offers excellent accessibility for partygoers in wheelchairs and young children, and as you are not confined by the size of a traditional photo booth, you can opt for full length image, and take large group photos as well as individual shots. A Bride & Groom who are pleased they booked a Magic Mirror Screen for additional entertainment at their wedding reception. Magic Selfie Mirrors are packed with interactive features including touch screens, customisable text, frames, graphics and backgrounds. Kids will love signing their own photos! Choose from a wide range of effects to match your event and delve into a treasure trove of props. Once you strike a pose, the hidden camera inside the mirror will capture the moment instantly. It may even praise you for the perfect pose, or ‘shatter’ the glass if it doesn’t approve! Guests will have heaps of fun and take home mementos they can treasure forever, or upload their snaps straight to social media. Selfie heaven. IS A MAGIC SELFIE MIRROR RIGHT FOR MY EVENT? Magic Selfie Mirrors are a brilliant addition to almost any special occasion, including birthday parties, bar mitzvahs, weddings, anniversaries, work events and corporate celebrations. They provide guests with a highly interactive and personalised photo experience, and take up less room than a traditional photo booth. Want to dress up like a pirate for the camera? No problem. Want to load up on silly sunglasses and ridiculous hats, or pose with inflatable instruments? Be our guest! Magic Selfie Mirrors have an array of backgrounds for you and your party-goers to choose from. You can be pictured sitting on sunny beach in one shot, and on the moon in the next. Whatever you’re celebrating, you can customise the photos accordingly. For a birthday party, you can choose text overlay with the name of the person whose birthday it is, along with the date of the party, which will show on each printed photo. You can also select which effects you would like your photos to have, such as sepia for a retro look, or pop-art for a teenage birthday party. You can choose Christmas, Easter or Halloween themes, and even have animated effects! The only limit is your imagination! Renting a Magic Mirror for a wedding reception is becoming more and more popular as it’s such a fun way to engage friends and family and make the most of the more informal moments of the day. You will also be leaving guests with a great wedding gift that can be reprinted and added to the official wedding photographers shots. Magic Mirrors really bring out people’s creative side and you’ll find you have a queue of eager wedding guests waiting to take advantage of the free photos on offer. Before you know it, they’ll be putting on hats, silly glasses and boas and posing with props, while quality camera capture the moment perfectly. Digital copies of the photos will be sent to you and can also be uploaded to an online gallery for everyone who attended to find – meaning you won’t be pestered for the photos and they can make their way to Facebook and Instagram instantly. Magic Mirrors can be tailored to suit your wedding theme or colour scheme, with unique graphics, screens, backdrops and props. Discuss your preferences with your chosen service provider ahead of time and they will take care of everything. Most hire packages include unlimited photos plus an attendant who will be on hand at all times to keep the line moving, suggest photo ideas and help make the event fun for all and are especially a terrific way of keeping children entertained during the big day. Magic Selfie Mirrors have become an integral part of internal events including Christmas work dos and summer parties. What better way to let your hair down than to have a drink or two and and grab a hilarious pic of the boss with the rest of your team. It’s a fantastic ice-breaker, transforming a potentially dull office do into bundles of fun. Colleagues can pose for photos together and take away prints of their hilarious poses, complete with your company logo! This will make for great entertainment and the photos can then be uploaded to your intranet system for all co-workers to see. You’ll have the perfect desk photos for the office! Magic Selfie Mirrors offer a unique and fun way to get colleagues and clients to engage with and interact with each other, and they have become an integral part of corporate entertainment. They can really capture the spirit of glamorous charity dinners, fundraising & charity events, company galas and award ceremonies. Guests, clients and delegates, dressed in sharp suits and stunning ball gowns, will adore posing for fabulous shots and with instant prints and digital uploads available, your night will be truly unforgettable. If you’re looking for some help customising your magic mirror experience, this is easily arranged. Hire companies specialising in corporate events have design teams on hand to create a bespoke experience, customising backdrops and photo branding, to incorporate your logo and corporate identity. Looking for a guaranteed show-stopper to draw in the crowds at a trade show or product launch? A Magic Mirror will undoubtedly get potential clients queuing up to take their turn. The mirror can be placed at your stall where the customers can be offered a free photo in exchange for a mailing list sign up. You’ll find interest in your product gets a huge boost and, importantly, potential clients can take away their photos, with your company logo printed on them. What a brilliant reminder of your product, perfect for getting your name out there. HOW MUCH WILL A MAGIC SELFIE MIRROR COST? As a rough guide, you can expect to pay £350 - £600 for up to 3 hours hire ($350 - $600 in the U.S. and €390 - €670 in Europe). This usually includes delivery, set up, host and props. Since prices vary, we highly recommend getting in touch with your chosen hire company for a free, no-obligation quote. Our easy-to-use directory allows you to search for the rental companies in or near your local area. You can then use the contact form on their profile to enquire what hire packages they offer. Some companies will also add a rough price guide to their profile for your convenience. HOW LONG CAN I HIRE THE MIRROR FOR? The Magic Mirror can be hired for your event from the moment it begins until the moment it finishes. Initial quotes are usually for 2-3 hours, with hourly rates reducing after that. A Magic Selfie Mirror is a self-contained service that can be set up almost anywhere and fit into even the smallest venue. An area of about 1.5m x 2m is sufficient for the mirror, and you’ll need some extra space for standing / posing, props and an assistant. Rental companies supply all the necessary equipment. The quickest way to find a Magic Mirror for hire in your area is to use our simple search function. Just add your location and click search. Our latest testimonials are also a fantastic way to start getting some ideas for your shortlist. Once you’ve found your ideal hire company, just contact them direct! Even better, if you would rather they came to you, you can request multiple quotes, and this service is completely free! 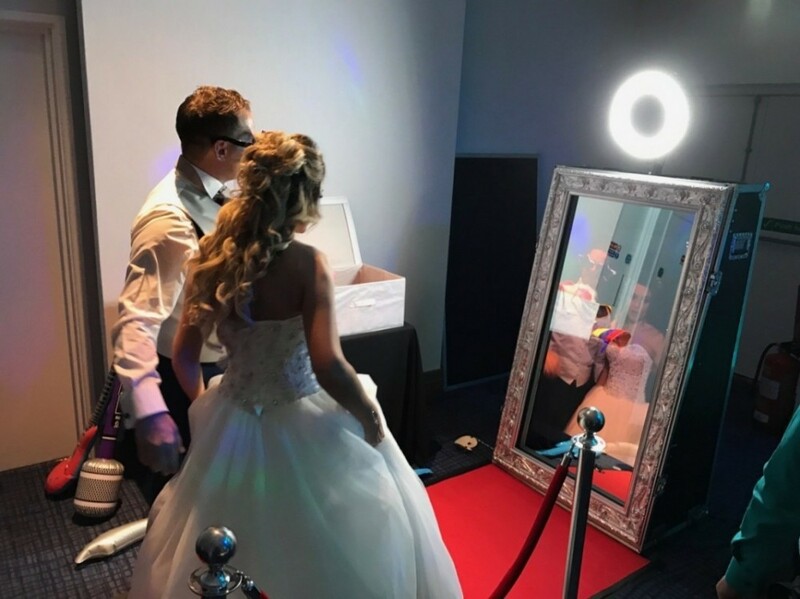 Hiring a Magic Selfie Mirror can make all the difference to your event, and we know we have exactly the right provider on here waiting to fill your party or event with magic and smiles. We hope you enjoy your search but do contact us if you need any help. Search our directory for the best Magic Selfie Mirrors for rent at your party, and you will be presented with a selection of professional and experienced hire companies who will provide you with a unique form of entertainment. WANT TO RECEIVE A RANGE OF QUOTES FROM Magic Selfie Mirrors?